In its most basic representation the banjo neck side profile pattern consists of three rectangles; one for the peghead, one for the neck, and one for the heel. The scale length of the instrument determines how long the neck should be. If you haven’t thought about the scale length of your instrument you can read about scale length considerations here. Keep scale length in mind when making the banjo neck side profile pattern. I have just one side profile pattern that I use for banjo necks. It works with both 11 and 12 inch rims. Given the same scale length, the neck for a banjo with an 11 inch rim is slightly longer than the neck for a banjo with a 12 inch rim. I add a 1/2 inch to the heel of the pattern for necks intended to go with 11 inch rims. For a 12″ rim I usually allow 19″ for the length of the fingerboard for an instrument that has a 25.5 inch scale length. In the case of an 11″ rim I use 19.5″ for the fingerboard length for an instrument that has a 25.5 inch scale length. Use the side of the workpiece that has been trued by the jointer as the line that represents the fingerboard. Mark it at the correct length that corresponds to the scale length of your choice. On the finished banjo the neck will tilt back from the plane of the front of the rim at an angle of 3 degrees. At the heel end of the neck, use the protractor to mark a line at 87 degrees perpendicular to the surface that will be the fingerboard. This line can be as long as the workpiece is wide for the present, it represents the angle that the heel of the neck will be cut at. Mark the back side of the neck heel by measuring up from the line just marked about 3″. Make a line parallel to the fingerboard surface. There are a variety of ways that the heel of a banjo neck can taper into the handle portion of the neck, I use a gentle inside curve. Now let’s layout the peghead. The plane of the peghead must tilt back from the plane of the fingerboard at about 7 degrees. The peghead should be between 6 and 7 inches in length. If you have one of the machine tuners you intend to use, measure it carefully, or try fitting it to a piece of scrap wood to get an idea of the total thickness the peghead will need to be. Consider the thickness of the peghead overlay when planning the thickness of the peghead. If you do not intend to use an overlay, the thickness of the peghead can be the same as the measurement from the tuner. If you do intend to use an overlay, the peghead will have to be thinner than the measurement from the tuner in order to accommodate the thickness of the peghead overlay. To arrive at the correct thickness, subtract the thickness of the peghead overlay from the measurement from the tuning machine. I would recommend that the peghead be at least 3/8″ thick after sanding and leveling, in the case that an overlay of 1/8″ thickness will be used. 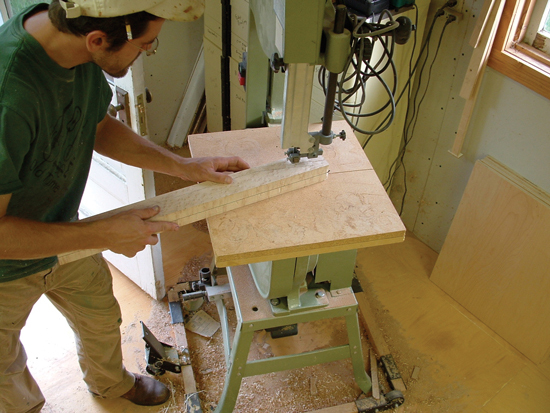 In the case of no overlay, the peghead must be at least 1/2″ thick after sanding and leveling. Draw a rectangle of the appropriate dimensions for your plan. 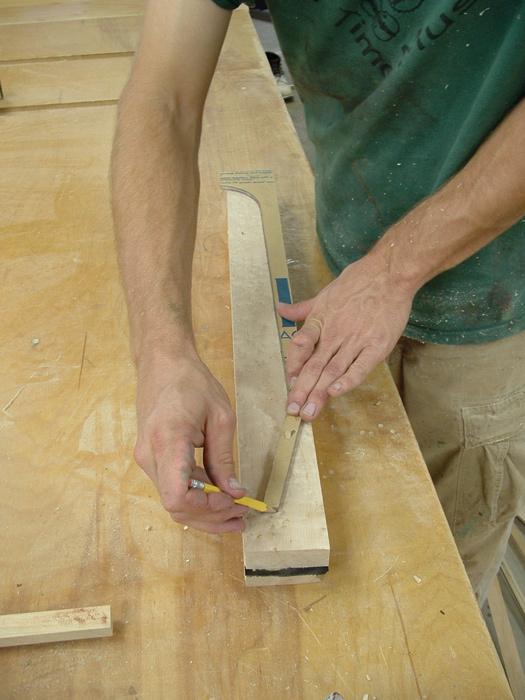 Using the line that meets the plane of the fingerboard as the long side that will be the face of the peghead, mark the back side of the peghead by making a line parallel to the first. Mark the neck to be 1″ thick where the peghead meets the backside of the neck. The neck gets thicker as it nears the heel. At the place where the neck meets the heel, the neck should be at least 1.5″ thick. Draw a straight line to mark the backside of the neck. After the pattern is complete, use it to mark the side profile of the neck on the workpiece. When you are satisfied with your layout, cut it out with the band saw. It is okay if the peghead is a little thick as it will still have to be sanded flat. A little of the thickness may be removed at that time. After the side profile has been cut out I call the workpiece a neck blank. Save the extra pieces that were cut out from the backside of the neck. They may be handy for making “ears” and the dowel stick later on. Cutting out the side profile of the banjo neck with the bandsaw. Let the neck blank “rest” a while. After removing so much wood from the back of the neck the new shape is free to bend in response to its own internal tensions. A twist in the wood that has not been active may become active because the wood that has been removed from the backside of the neck no longer restricts it from moving. The neck blank’s moisture content is also subject to change. Lay aside the neck blank for a few days or weeks. In the summertime I often cure neck blanks in a hot car for a few days to cook out any moisture. Curing is double important when working with figured woods! The variety of grain in figured wood makes for beautiful patterns, it may also create unseen tension that can cause a warp. Give the neck blank the time it needs to cure properly. If possible lay aside the neck blank for a full year. After curing, check the neck blank against the jointer bed to be sure that it is still straight and true. If you find that the neck blank has warped or twisted in any way, use the jointer to very carefully return the fingerboard surface to a flat, even plane. Be mindful of the angle where the peghead surface “breaks” from the fingerboard surface. That break-point needs to stay consistent at 90 degrees across the width of the neck blank.